In the fall of 2015, hazardous levels of smoke from agricultural fires blanketed much of Equatorial Asia. Schools and businesses closed, planes were grounded and tens of thousands sought medical treatment for respiratory illness. In a new study, Harvard University researchers and their colleagues estimate that the 2015 smoke event caused upwards of 100,000 deaths across Indonesia, Malaysia, and Singapore. To mitigate the impact of future smoke events, the team developed a model framework which could help governments and policymakers in Southeast Asia identify, in almost real time, the fires with the highest potential to cause damage to human health. The research is described in Environmental Research Letters. It was led by researchers from the Harvard John A. Paulson School of Engineering and Applied Sciences (SEAS), the Department of Earth and Planetary Sciences, and the T.H. Chan School of Public Health, in collaboration with colleagues from Columbia University. “Our hope is that this framework can inform early-response efforts to identify areas where effective fire and land use management would yield the greatest benefits to human health, even as the haze event is still unfolding,” said Loretta J. Mickley, Senior Research Fellow at SEAS and coauthor. The research is part of a larger effort by Harvard and Columbia to provide local stakeholders with an effective tool to assess the public health costs from fires and guide policy decisions. The framework uses a mathematical model to quickly identify the fires that will have the biggest impact on human health downwind. Fires started by farmers in Indonesia, particularly those producing palm oil and timber for wood pulp and paper, are the main culprits of haze events in this region. The fires, largely in coastal peatlands, burn at relatively low temperatures and can smolder for weeks or even months before extinguishing, resulting in lots of smoke. During periods of extreme dry weather caused by El Niño and a phenomenon called the positive Indian Ocean Dipole, smoke emissions are considerably higher — either because farmers are taking advantage of the dry weather to burn more land or because once burning, the fires are more difficult to control. 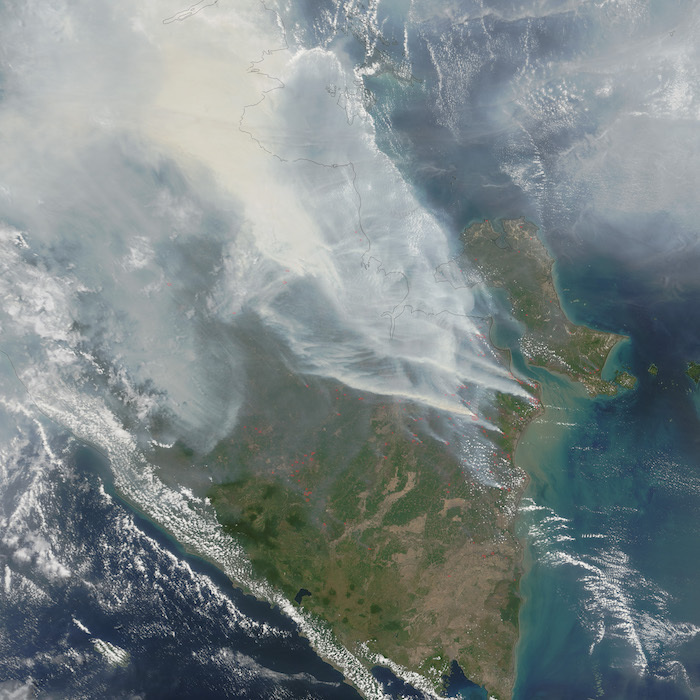 Although many fires burn in remote areas of Indonesia, prevailing winds can carry the smoke hundreds of miles to densely populated cities like Palembang in Sumatra, and Singapore and Kuala Lumpur. The region experienced similar smoke conditions caused by El Niño in 2006 but the Harvard-led team found that deaths from air pollution more than doubled between the 2006 and 2015 events, from about 38,000 to about 100,000. This is largely because of where the fires burned in relation to population centers, and their intensity. Fires in southern Sumatra and nearby Jambi province turn out to be particularly deadly. Being able to identify the most dangerous fires could help save lives in the future, Buonocore said. “For the first time in Indonesia, we have a rapid assessment modeling tool that can quickly estimate the cost to human health of these haze events, as they are happening,” he said. In ongoing work, the researchers are using the model to diagnose the health impacts of different land-use scenarios over the next 20-30 years. This effort could promote more rational land-use decisions and management that could save thousands of lives. “If regional policy makers understand fully the health dimension of these biomass fires, we believe they will be in a better position to manage them more effectively and improve human health and ecosystems at the same time,” said Ruth DeFries, of Columbia University and coauthor of the paper. This research was funded by the Rockefeller Foundation.